"The name speaks and the gift delivers loads of happiness! 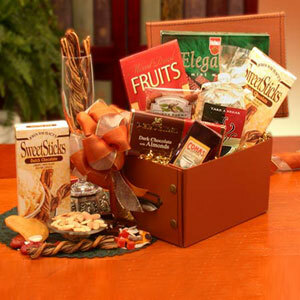 With 12 exquisite chocolate items and snacks, this gift is sure to deliver a big treat for any occasion of your loved one! 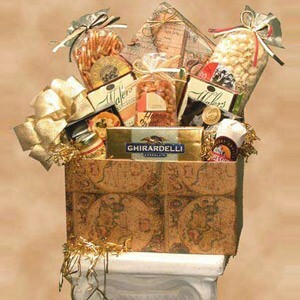 So perfect a gift that it is chose by our experts!Buttery Pretzel 2 ozWhite Cheddar PopcornCaramel Corn 2 ozBrent & Sams Chocolate Chip CookieOld Fashioned Peanut Brittle 6 oz box1/2 oz Stone Wheat CrackersCheddar Cheese PretzelsMocha Chocolate Truffles 2 oz ( 4 pcs)Creamy Cheddar Cheese SpreadSummer Sausage 3 oz.Classic Antique Gift Box Large (Also try our gerberas, carnations, mixed arrangements, flowers, lilies, orchids, bonsai trees, cookies, toys, candles, gift hampers, crystal, barwares, tote bags, cakes, desserts, candy, snack foods, birthday gifts, anniversary gifts, wedding gifts, sympathy flowers, plants, chocolates, teddy bear, wine & champagne, gift baskets, spa gifts and christmas gifts)"
"Send this basket to those you wish to impress or congratulate. 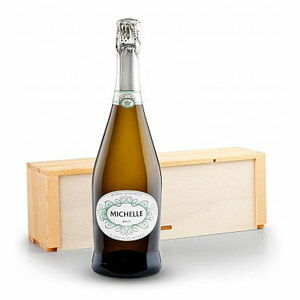 Two well-regarded wines (your choice of two red, two white, or one of each) or one bottle of distinctive champagne are nestled in a traditional basket filled with an array of delicious foods guaranteed to be relished. 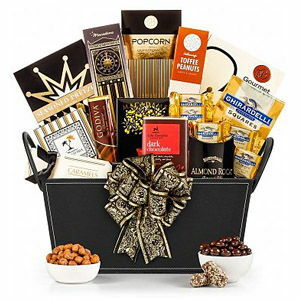 The recipient will also discover gourmet selections such as specialty crackers, cheese, dips, smoked seafood, cookies, candies, teas, or coffees. 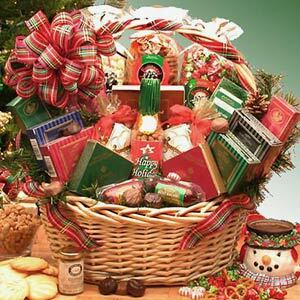 Exact basket, gourmet selection, and wine may vary by season and delivery location. (Also try our gerberas, carnations, mixed arrangements, flowers, lilies, orchids, bonsai trees, cookies, toys, candles, gift hampers, crystal, barwares, tote bags, cakes, desserts, candy, snack foods, birthday gifts, anniversary gifts, wedding gifts, sympathy flowers, plants, chocolates, teddy bear, wine & champagne, gift baskets, spa gifts and christmas gifts)"
Make the wine lovers go drool over your exquiste choices of gifting with this irresistible basket of wine, cheese, nuts, coffees and many more gournet items! They sure love ya! Because our experts can't go wrong! 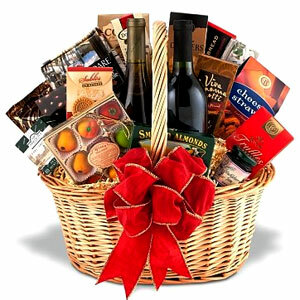 "Send this Delicious pair of Wine directly from California Vineyard to your loved Wine-lover.This elegant and sophisticated gift includes a California Wine duet of your choice complemented with Parmesan Artichoke Cheese Biscuits, Sesame Stix, and Seasoned Almonds. Presented in a one-of-a-kind wine box, this gift is ideal for every occasion.Measures 13' x 14' x 5'.Wines are available for delivery only in few states, because of restrictions of the Federal Law.The states to which we can deliver are: (AK) ALASKA, (AZ) ARIZONA, (CA) CALIFORNIA, (CT) CONNECTICUT, (DC) DISTRICT OF COLUMBIA, (HI) HAWAII, (ID) IDAHO, (IL) ILLINOIS, (MI) MICHIGAN, (MN) MINNESOTA, (MO) MISSOURI, (NH) NEW HAMPSHIRE, (OH) OHIO, (OR) OREGON, (SC) SOUTH CAROLINA, (VA) VIRGINIA, (WA) WASHINGTON, (WY) WEST VIRGINIA. 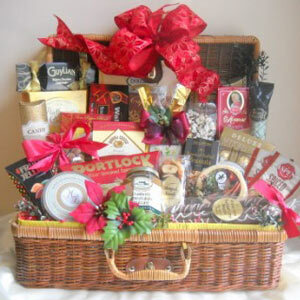 (Also try our gerberas, carnations, mixed arrangements, flowers, lilies, orchids, bonsai trees, cookies, toys, candles, gift hampers, crystal, barwares, tote bags, cakes, desserts, candy, snack foods, birthday gifts, anniversary gifts, wedding gifts, sympathy flowers, plants, chocolates, teddy bear, wine & champagne, gift baskets, spa gifts and christmas gifts)"
"The suitcase hamper is packed closed for shipping with tissue, shred and Poinsettia bloom. To give a wonderful surprise on opening. To include:- Walkers shortbreads, Butter pretzels, Pepper & Poppy Water crackers, Mixed nuts, Cherrington of Scotland cookie packs - 2 flavors, Bellagio Hot chocolate mixes x 2, Pazazz Fruit Jellies, Ferrero Rocher crisp chocolates x 12, Peppermint chippers - white chocolate with peppermint bark chips, Aspen Spiced Cider mix x 2, Cheddar cheese round, 3 Pepper crackers, Smoked Salmon, Ernest Hemmingway Tea samples, Balsamic Onion spread from Robert Rothschild farms, Wine flavored cheese spread, Lobster pate, Flavored Coffee pack, Mama Mia Dip pack, Beef Summer sausage, Reber Mozart nougat Twists, Chocolate drizzled Popcorn and Tiramisu Pillows. Poinsettia accents and handmade elegant bows and ribbons adorn the case on closure. (Also try our gerberas, carnations, mixed arrangements, flowers, lilies, orchids, bonsai trees, cookies, toys, candles, gift hampers, crystal, barwares, tote bags, cakes, desserts, candy, snack foods, birthday gifts, anniversary gifts, wedding gifts, sympathy flowers, plants, chocolates, teddy bear, wine & champagne, gift baskets, spa gifts and christmas gifts)"